What’s the most crucial thing to keep in mind when starting a recycling program? Proper planning. 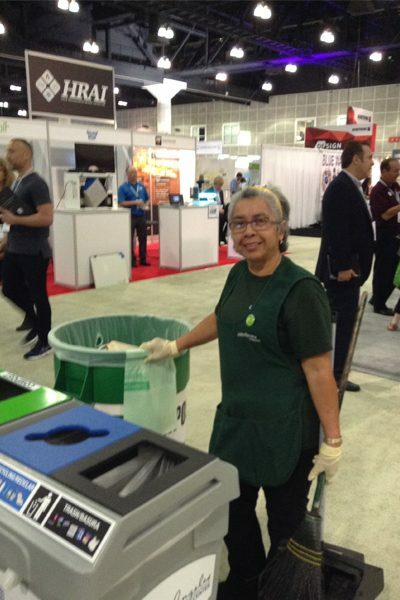 We’ve heard a number of stories of companies who enthusiastically started recycling programs only to discover there was no end market for what they were collecting. A plant in Port Perry had collected 10 tons of batteries before they found out that batteries weren’t recyclable and would all be going to a landfill. Tesla had set up special bins to collect safety glasses from hundreds of employees a day; then the hauler wouldn’t take them because of the screws. 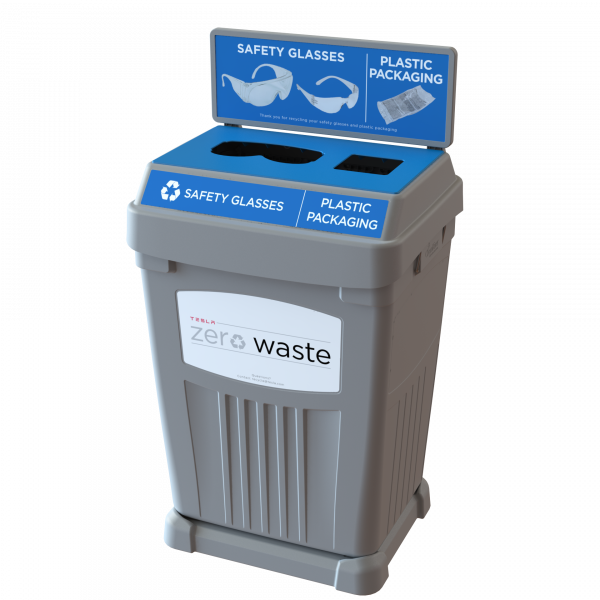 Custom Flex E™ Bin with Safety Glass Stream for Tesla. Sometimes large organizations will set a goal to be sustainable and then simply inform their facility management firm about their plans. Their facility manager then has to juggle all the suppliers they currently have in place, and often a lot of contracts need to be broken and new, more sustainable, suppliers need to be scouted and contracted in so as to meet the guidelines of the new recycling program. 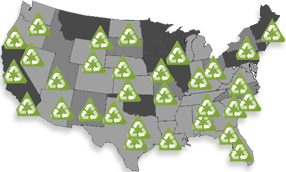 Location and number of people who live in the area can be a determining factor in the success or failure of a recycling program. In Northern Ontario for example, most businesses are unable to provide recycling solutions as the only recycling facility is 800 miles away. This makes recycling not only extremely expensive but near impossible to do. In Montana, it’s expensive to send waste for recycling because there’s isn’t a lot of recycling in that area. In Mexico they’re mandated for organics, but don’t have trucks set up to collect organics yet. To efficiently collect recyclables, you might need to buy new equipment and new recycling bins. To determine how many bins you need, you need to understand the flow of traffic and what you’re collecting. Look at how many streams you want to collect and how many people will be using the bins. Do you require indoor and outdoor bins, and if so, how many will you need? In some instances, there can be issues with unions v.s. employees. If a recycling program is not in the custodial team’s job description, their unions can put in a grievance. As union members, the custodial team can’t be made to participate in the new recycling program if they do not want to. Therefore, the custodial team needs to be on board with the plans. If you don’t have their buy in, you can’t make it happen. Sometimes the space doesn’t efficiently accommodate recycling. For example at a hospital in Toronto, the architects didn’t build the driveway big enough for a waste hauling truck to come through. So instead of emptying their waste into 3 main outdoor bins, they had to drag 10 to 12 smaller bins down to the truck to dispose of their waste. As part of your planning process when starting a recycling program, be sure to consider all the potential challenges that could affect your ability to implement an effective program and determine if you are able to work around them or not before investing. For further assistance in setting up your recycling program please contact us here. and 3 Reasons Why You Should Let Your Recycling Bin Tell It’s Story. If you’d like more information on how to implement a revenue-generating recycling program for your office, please call us at 1-888-646-4246 or email solutions@cleanriver.com.